When i saw this picture first, I had a thought: whether those yellow patches are really the holes? That was what I meant with "clever design" in my post, but that wasn't obvious (you are not the first one commenting on it). When I first saw this picture, the number 2 immediately came to my head. Then as I kept reading the article I was thinking "oh yeah true, could be one or two holes in the back of the shirt"...... "Yep yep what constitutes a hole? (I.e. 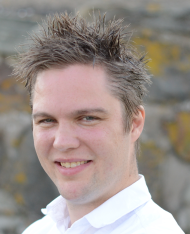 could be very very small)"
... and I think it's almost impossible -not- to come to those quick conclusions. The important thing to me is to not just accept those answers but rather to stop and question if we've really found a true/true enough answer. * Maybe the shirt has a laundry tag. That loop might count as a hole. * Maybe this shirt belongs to a man with one arm. One arm hole is sewn up. That could mean one less hole or more depending on the definition of hole and the size of the stitching. * Maybe this ripped shirt is the logo of the Ripped Shirt Company on the front of the actual shirt and the image is just zoomed in on the logo. Most of the shirt is out of frame, so we'll never know how many holes there are. A truly great example of fast vs slow thinking, thanks for posting this :). I got 16 holes. 1 neck 2 sleeves 1 waist 2 holes in front 2 holes in back.totaling 8. But then I thought of a sphere (a ball) if you drill a hole into a sphere you would end up with 2 holes yes one drilled but it would have two holes on it. 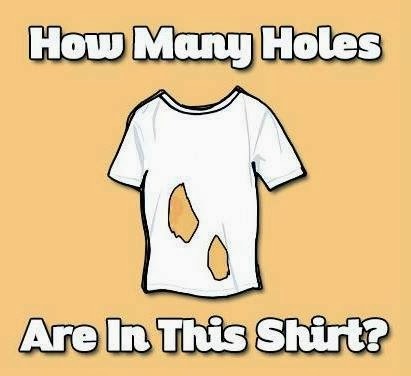 So if you turn the shirt inside out you have another 8 holes so. What really is the answer 16 or 8. Like I said in the post "at least zero", but might not be a shirt anymore if you remove holes for arms, head and lower body. The openings in the shirt are not holes. Duh. There is a minimum of three holes in the shirt. It was there all along! how could nobody noticed. 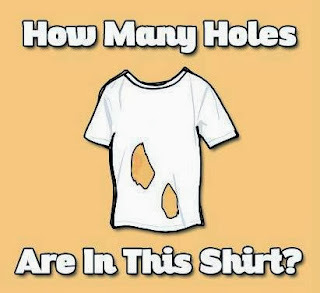 If you turn the shirt inside out, they are the same holes, so it's still only 8, not 16. However, that is assuming there are corresponding holes in the back to the front and not just one big hole and no other holes! If you want to know the correct answer of this puzzle, watch this youtube video.